Sauces and pestos have been our saving grace during the Local Thirty challenge. It’s so easy to jazz up any meal with a dollop of pesto, roasted eggplant dip, yogurt sauce, or a simple dressing. And as someone who’s made pesto using a variety of nuts–everything from pine nuts to walnuts to peanuts–I’d never thought to use hazelnuts even though they grow locally right in my backyard (or 10 miles down the road to be more accurate). And damn–I’ll be the first to admit that I’m not going back. 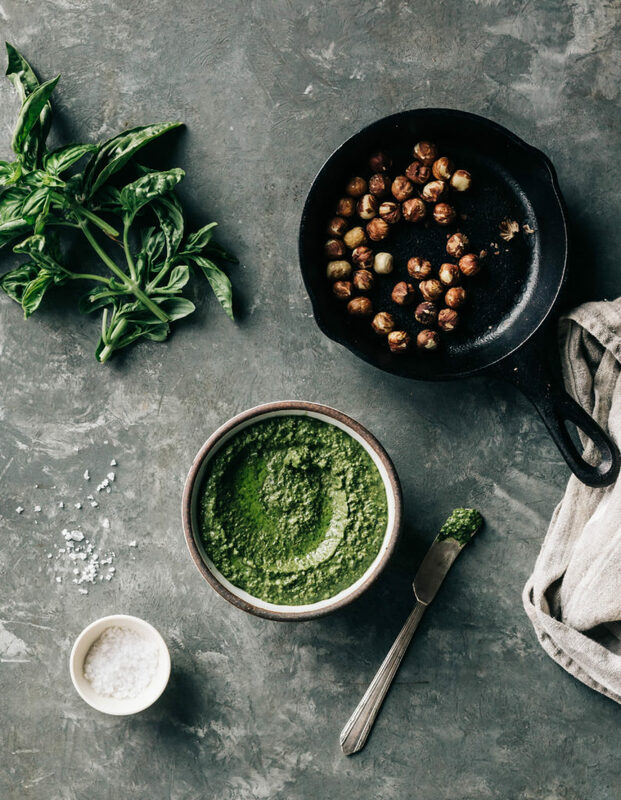 This pesto is hands down the best we’ve ever had and I’m so thankful to have discovered that toasted hazelnuts add such a lovely flavor to one of my favorite condiments. We even toasted our garlic a bit too, which mellows it out but also deepens it’s flavor. I highly recommend doing this for all your pesto recipes (even if it’s not this recipe) it’s really a nice addition. I hope you all enjoy this pesto as much as we do. And heck, if hazelnuts aren’t available in your neck of the woods, you can substitute with another nut or seed. The flavor will be different but it will still work. Pesto is forgiving that way! Also– if you plan on doubling or tripling the recipe to freeze, make sure to use wide mouth mouth pint or half pint mason jars. Fill the jars with the pesto leaving at least 1 inch of head space and drizzle a little olive oil on top. Place the lids on and freeze for up to 6 months. Heat a small skillet over medium heat. Add the hazelnuts and toast, shaking the pan often, until fragrant and lightly browned, about 8 minutes. Remove from the heat. When cool enough to handle, roll the nuts in a kitchen towel to remove the skins (you don't have to be perfect here, some of the skins are fine left on). Heat a small skillet over medium heat and add the garlic cloves. Toast the garlic until lightly browned on all sides, making sure to shake the pan often as to insure you don't burn the garlic. This should take 4-6 minutes total. Add the hazelnuts, garlic and basil leaves to the bowl of a food processor. Process until a coarse texture is achieved. With the motor running, slowly drizzle in the olive oil. Season with plenty of salt and a splash of red wine vinegar. Continue to process until everything is blended together well. Taste for seasonings and adjust as needed. If you plan on freezing the pesto-- I'd make a double or triple batch. Fill wide mouth pint or half pint mason jars with the pesto leaving at least 1 inch of head space. Drizzle with a little oil on the top before placing the lids on and freezing for up to 6 months. I just added my freezing tips to the recipe! I hope that’s helpful! I always love freezing my pesto in mason jars. Make sure to use wide mouth mason jars and fill them (leaving 1 inch of head space) and drizzling the tops with olive oil before placing the lids on. Pesto freezes well for up to 6 months.